Watching the third episode of the documentary The Game on RTÉ One it was lovely to look back at Joe Connolly's rousing speech in 1980 after that team won the All-Ireland final and broke into the top tier of hurling again. With Galway in bacK-to-back All-Irelands this weekend, some younger supporters might not know, or have forgotten, that the Tribesmen did not win the Liam McCarthy Cup for 57 years, from 1923 to 1980. 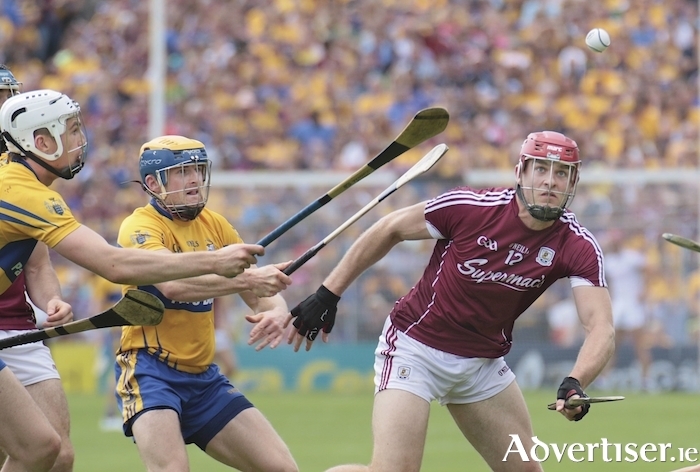 That Galway have only won the hurling championship five times (1923, 1980, 1987, 1988 and 2017 ) means weeks and days like next Sunday should be totally savoured. An Rud is Annamh is iontach - "What is seldom is wonderful." After last year's victory over Waterford there is a nervous anticipation within the county that this panel can produce another winning performance against Limerick this Sunday at 3.30pm in Croke Park. The current squad of players are seriously talented and committed. Their hurling skill, drive, commitment and physicality make them a really tough team to beat. Alongside the excellence of the management team of Mícheál Donoghue, Noel Larkin and Frannie Forde, this Galway squad is a player led and driven group. Team captain David Burke, Joe Canning, Daithí Burke, Johnny Coen, James Skehill, John Hanbury, Joseph Cooney, Padráic Mannion and Aiden Harte are all in their mid to late 20s and they know what has to be done week-in, week-out if they are to enjoy All-Ireland success. These players know the value of consistent performances as evidenced by their 13 match unbeaten run. Enough of them were also involved in the final defeats of 2012 and 2015 to know what that pain feels like and they do not want to revisit that feeling. Probably the team's most impressive period this season was in extra time against Clare in the first All-Ireland semi-final at Croke Park. Key players such as Joe Canning, Gearoid McInerney, Conor Whelan and Adrian Tuohey were all off the field, and the team still managed to eke out a draw. Many teams would have folded in that cauldron, but Galway dug deep and their reward was a replay, and following that a one point win and a ticket to this final. They enjoy competing at the top, and against Limerick this weekend they have another challenge to overcome if they want to be back-to-back title winners like the great team of 1987 and 1988. Limerick manager John Kiely has some very impressive players on his squad, such as goalkeeper Nickie Quaid who made that master flick to save the day against Cork. Mike Casey at full-back, and a half-back line of Diarmaid Byrnes, high fielding centre-back Declan Hannon and Dan Morrissey will not flinch. Cian Lynch always catches the eye at midfield and number 10 Gearóid Hegarty is a big powerful man who is well able to gather possession from puck-outs. Inside, free-taker Aaron Gillane is a former U21 star alongside Seamus Flanagan and Graeme Mulcahy. In the semi-final win, it was their impact subs, in particular Shane Dowling, Peter Casey and Pat Ryan, who changed the game when they were six points down going into the last 10 minutes, and on Sunday Micheál Donoghue will have Galway well prepared and ready for those players arriving off the bench. Limerick are in their first final since 1973 and they will be a tough opponent. Based on Galway's superior scoring threat from Joe Canning, Conor Whelan, Cathal Mannion, Johnny Glynn, Conor Cooney, David Burke and impact subs Jason Flynn and Niall Burke, they look the better choice to come through on Sunday. Galway have scored a total of 10-182 in their eight games to date, an average of 27 points per game, with free-taker Joe Canning their standout performer with 1-68. Conor Whelan is the next most proficient marksman with 2-18 on the board. If they can get plenty of supply from the half-back line and midfielders Johnny Coen and David Burke, it is difficult to see the Limerick defence holding them. If the opposition plays a sweeper, as Waterford did last year and Clare did in the replay, they can play around it as Conor Whelan showed with his adaptability in the replay against the Banner. If the opposition wants to play a running game, this current team is able to deal with that. If Limerick decide to pack the middle third and make it a war of attrition, Galway will roll up the sleeves for that too. Galway have such a huge variety of scorers, with 14 different players having scored in the championship to date. Interestingly 26 players have seen action for Galway in the eight games in 2018, with players such as Davy Glennon, Ronan Burke, Paul Killeen, Sean Linnane, Shane Cooney, Padraig Breheny and Eanna Burke all having seen some action off the bench, while Glennon has come on in four championship games. "I think we are more experienced this year and we have drawn on that experience," says Micheal Donoghue. "You draw on the good and bad, and you go from game to game and take what you can learn from each. Against Clare we learned from the drawn game and implemented it in the second game. That experience will stand to us. "We are exactly where we want to be. Obviously we know it is going to be very formidable [challenge] against Limerick, but you have to be in it to win it."